Getting together to pray for our local neighbourhoods. If you can’t walk to it in less than 10 mins, then you can’t join! Pray for your neighbourhood, not each other! 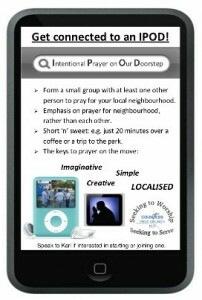 It just needs a minimum of 2 or 3 who live within 10 mins of each other to find a mutually convenient time & place, and get on and pray. People choose the time/place/frequency (typical frequency is circa every 3 weeks).